Growing up in the 80’s most children looked up to athletes like Ken Griffey Jr, Barry Sanders, Andre Agassi, or Wayne Gretzky, but if you lived in Erie, PA and knew anything about the Quad Games you most likely idolized athletes like Dave Utley, Dana Munger or Jim Samuels. In the 80’s Jim Samuels had the perfect flat top, he was constantly making headlines for winning races, he started skate skiing before skate skiing was a thing, and was just cool (so I hear)! 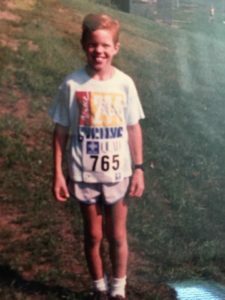 Jim was one of the reasons in 1987, at the age of 7, Eric Krause was begging his parents to let him register for the Quad Games. This was years before the Quad Kids, so no matter how old you were, you were competing in the “adult” distances: 100 yard swim, 12 mile bike, 5 mile run, and 5 mile ski. In 1988, Eric’s parents finally let him compete in his first Quad Games. Between 1988 and 1992 he competed in five Quad series and 21 individual Quad events. Little did he know his first Quad race would be the first of many more! Eric’s parents, Leo and Mame, have always been active. His mom was an avid skier and runner, his dad can still be seen covering miles of road on his bike. Many of Eric’s childhood memories took place at the Elk Valley Golf course on skis or at local races. Eric’s first bike race was at the Erie Time Trials. He covered the 12-mile course on a BMX bike. He remembers his mom having an Ironman Timex watch (top technology at the time) and he always wanted to try it out. She said he could wear it, but only in a race. His parents found the perfect balance to motivate Eric to be active. They encouraged him to participate, but never pressured him. They showed him that being active was fun and something the family could do together. Soon high school and college sports took over and The Quad was a childhood memory for Eric. 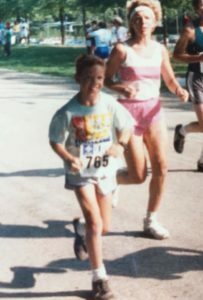 He competed in track and cross country at McDowell High School and then continued his successful running career at Indiana University of PA (IUP) between 1997 and 2001. In 2002 he moved to Maryland and met his wife Jamie. He continued running, but nagging injuries finally forced him to hang up his running shoes and spend more time on his road bike. He soon became a CAT II racer and competed in over 20 races per year. In 2015, Eric and his family moved back to Erie when he transferred locations within Erie Insurance. Since the cycling scene is a little light in the area, he decided to take on the Highmark Quad again. He is a consistent age group award winner and in 2018 placed 6th in the overall Quad Series. The accolades are great, but what Eric likes most about the Highmark Quad are the wonderful childhood memories it gave him, the motivation and opportunity it gave him to lead an active lifestyle, and being able to watch the hundreds of people participate in every event. He is most impressed with the performances of the “Everyday Champions” he sees cross the finish line. This year he is competing as part of Erie Insurance’s corporate team, but he hopes that his wife, Jamie and their children will be toeing the starting line of the 2019 Highmark Quad events with him. Back in 1988 Eric’s first Quad Game event led him to a successful high school and college career along with the motivation to live an active and healthy life. No matter what your age or ability, Eric challenges you to be the next “Everyday Champion”! Do you have what it takes? !